Choose a design feature that will complement not only the pool itself but also tie in well with your home. Whether you are following a trend or have a more classical idea in mind, it needs to work in well with the surrounds. Award Pools Group in Sydney can include any of the pool features described on this page within your pool design. Contemporary pool features often include water walls or stand-alone water features. A contemporary pool design will usually include sleek and clean lines but more classical pools may include statues and fountains. You could choose a pool design feature that works well with the environment such as rockeries in a bush or property setting, or Balinese features in a beach setting. What type of pool features might you consider in your pool design? 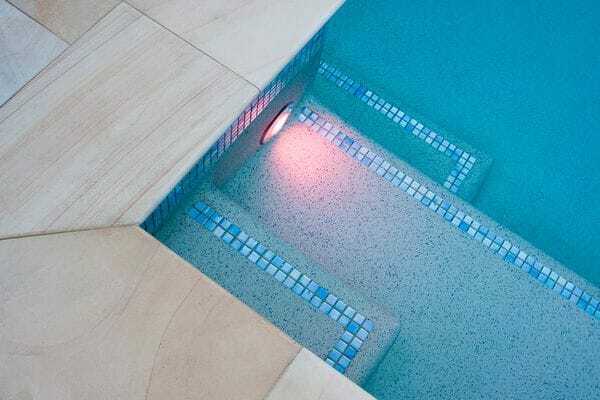 Swimming pool features could include interesting coping, lighting, decks, waterfalls, fountains, statues, water walls, steps and ledges, Baja shelves, rockeries, beaches or building structures such as a cabana. Pool coping is the capping of the pool shell wall. Coping defines the edge of the pool. There are many different materials that can be used from natural stone to a wide variety of man-made products. Discuss with your pool builder what lighting you want - lighting can add sensational effects at night. A properly designed pool deck will help blend the pool area into the existing landscape, creating a natural look for the entire backyard. It is important to choose the right material for the pool deck design so it will blend in with any existing pool landscaping or building structures. There are various types of deck materials, size and shape, so you will want to go with a pool deck that best suits your particular tastes and lifestyle. Please note that planning regulations in Sydney often include stipulations as to swimming pool deck material, particularly for bush fire prone areas. Incorporating a water feature, such as a waterfall or fountain can complement your pool design. Water features come in many different styles. Swimming pool water feature variations are endless. Whatever your pool design ideas may be, Award Pools Group can help you transform your vision into a reality. Consider size when choosing a water feature. The feature should fit into the pool and garden. If a feature is too small, it will look lost and if you build it too big, it will dominate. Hiding all the equipment used in a water feature is a very important consideration. You want your swimming pool water feature to look beautiful. Swimming pool water features can certainly add that extra "pizzazz" to your pool design. Today's choices are exciting and varied. Waterfalls can be sleek and contemporary like the ledge design where water cascades as a translucent sheet: perfect for modern pool designs. If you are after something more natural that will blend with your pool landscaping, the rock waterfall is an ideal choice with its gentle trickling of water at various points. Fountains are another form of swimming pool water feature and come in various shapes and designs from Italian inspired water jugs to ornate taps or figurines elegantly "tipping" water into the pool. These are just some of the MANY options available. The right water feature can really complete the look or theme of your pool design. The sound of water is often as appealing as the look of water and there is no doubt that a water feature adds to the overall ambiance of your swimming pool. Interesting lighting can further highlight your water feature and make it a beautiful element to be enjoyed ALL year round! How and when can a water feature be added? Water features can be added during the pool building process or to an existing pool. If you are considering installing a water feature in your swimming pool and you are still undecided, talk to your pool builder about allowing for it when the pool is being built. By allowing a water feature in the pool building process, it means you can build it in later with little fuss if budget becomes an issue. It is more difficult to add the pipes and other necessary equipment after the pool is completed. If you consider what you want from the start, it will save you money in the long term. 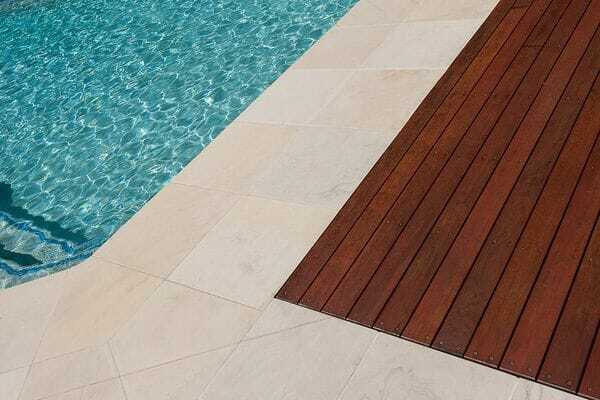 Steps and ledges are the most common features found in pool designs. The variations of design seem endless. Baja shelves are extended ledges, often used for lounging in shallow water, or for small children to have some safe water fun. Unless you are considering a beach feature, a step, ledge or Baja shelf would be an important consideration in your pool's design. Award Pools Group in Sydney can design steps, ledges and Baja shelves especially for your swimming pool and family requirements. A beach entry feature in a swimming pool means having an edge or entry gradually sloped from the grass or deck area into the water. This becomes deeper with each step, in the manner of a natural beach. This feature is attractive due to its "holiday/ resort" feel. While the feature is visually attractive, it can also serve as a practical entry for small children or older people with accessibility issues as there are no stairs or ladders to navigate. The use of natural and/or man-made rock can have a dramatic effect on your swimming pool design. The use of rocks helps to create a naturally serene and inviting atmosphere just as you would find in nature. There are endless possibilities for incorporating rock into your swimming pool design. Talk to Award Pools Group in Sydney about pool features, including coping, decks, water features, steps, ledges, Baja shelves, beaches and rocks. Our Features Gallery has some interesting ideas and we have client sites around Sydney with different swimming pool designs and features that you can view. We are both very pleased with the Job! Plenty of swimming this summer.